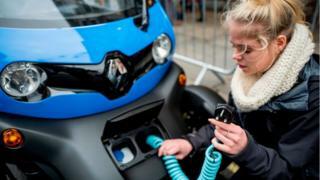 A "patchy" network of charging points is discouraging UK drivers from embracing electric cars, analysis suggests. The BBC's Shared Data Unit analysed data from Open Charge Map, a crowd-sourced website of charging locations. Not every location will feature in Open Charge Map, but it aims to be a "reliable single point of reference for charging equipment location information". There is no similar resource from the government. "I think my biggest issue is if we're going away from Exeter then things obviously get a bit more complicated," he said. "The main problem I've found is that it seems like charge companies are kind of regionalised in some way. When we went to Bristol - that's a journey of 80 miles — we needed to charge at some point." "But the app didn't work and the call centre I got through to couldn't operate the charger, so we were left in Bristol with a car with only 15 per cent on it and couldn't get home," he said. Is your local authority in the top 10? Nicholas Lyes, RAC head of roads policy, said: "These findings show that despite the Government's ambitions to accelerate the take-up of cleaner vehicles, charging infrastructure is presently something of a postcode lottery, and patchy at best in some parts of the country. "RAC research has found the lack of charging infrastructure is one of the three main barriers for electric vehicle take-up along with range anxiety and high upfront vehicle costs. "Clearly, we need to improve this access to charge points as a whole, but special attention needs to be given to installing more rapid chargers on the strategic road network as well as adding charging capability at car parks where people spend longer periods, such as at shopping and leisure centre car parks. "The key is to give drivers the confidence to go electric, which will not happen quickly unless they are given the right incentives to do so, alongside easy access to reliable charging infrastructure." Bridget Fox, from the Campaign for Better Transport, said: "Moving to electric vehicles, as well as reducing overall traffic levels, is vital to tackling air pollution, but for many drivers the lack of easy access to charging is a major barrier to making the switch." The Government's Road to Zero Strategy aims to slash vehicle emissions by having at least 50 per cent of new car sales ultra low emission by 2030, alongside up to 40 per cent of new vans. A spokesman for the Scottish Government said it now had "one of the most comprehensive charging networks in Europe" with more than 1,000 locations and an average distance of just two miles between points. The Shared Data Unit makes data journalism available to news organisations across the media industry, as part of a partnership between the BBC and the News Media Association. This piece of content was produced by a local newspaper journalist working alongside BBC staff. Additional reporting by Paul Bradshaw.